Now the September school holidays are over and the kids are about to begin term 4, you know that means Christmas is just around the corner. Rather than fight the festive season, why not embrace it and enjoy all the extra activities Melbourne has to offer. In just over a month from now, Santa and Mrs Claus will return to the Dandenong Ranges, for a series of Santa Specials on board the Puffing Billy. Your day or evening with Santa departs Belgrave Station and chugs along to Emerald Town Station. 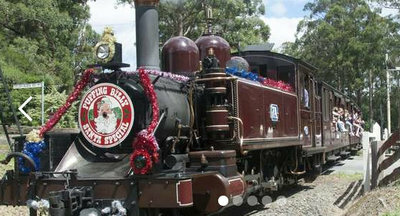 The whole family will enjoy festive fun whilst riding along Victoria's picturesque heritage railway route. There are two time slots to choose from; either Santa's Daytime Special, departing Belgrave Station at 10:55am with time to relax at Emerald Lake before returning back to Belgrave for 4:05pm. Santa's Sunset Special takes in the beauty of the region when the day turns to night, running on the same format as Santa's Daytime Special. Take in Melbourne's twilight sparkles as the day recedes, boarding Belgrave Station at 5:10pm and returning at 9:35pm. Santa Special's on board Puffing Billy commence on Saturday 28 November 2015. All December dates are at this stage booked out for Santa's Daytime Special, but you can still buy tickets for 28 November 2015. Alternatively, book onto Santa's Sunset Special on the evening of Saturday 12 December 2015. WHEN: Saturday 28 November 2015 (Daytime) Saturday 12 December 2015 (Sunset). COST: $14 child under 4, $35 child 4 - 14 years, $39 senior, $49 adult and $122 for a family ticket.